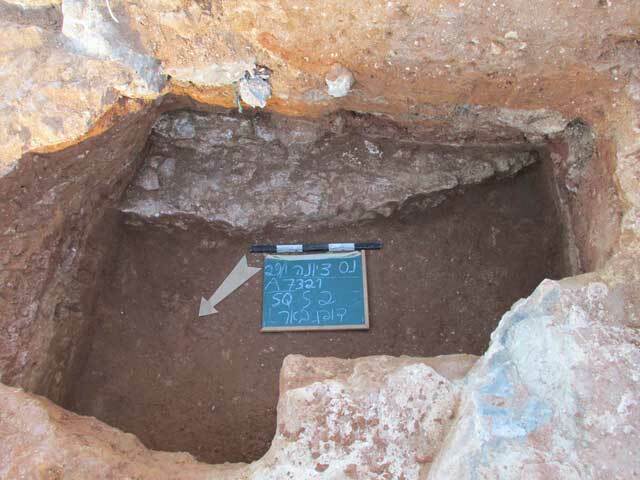 In January 2015, a salvage excavation was conducted in western Nes Ziyyona (Permit No. A-7321; map ref. 179965–80045/648605–79), prior to construction. The excavation, undertaken on behalf of the Israel Antiquities Authority and financed by the Schwartz Supervision and Construction Company, was directed by D. Golan with the assistance of L. Nadav Ziv and V. Shustin (area supervision and preliminary inspections), D. Abu Salah and L. Rauchberger (preliminary inspections), Y. Amrani and E. Bachar (administration), R. Mishayev and R. Liran (surveying and drafting), M. Shuiskaya (pottery drawing), A. Buchennino and H. Torgë (ceramics consultation), V. Nosikovsky (metallurgical laboratory), A. Sasson (consultation), Y. Marmelstein (millstone photograph) and M. Ajami. The excavation was to the west of areas where the author previously excavated irrigation channels and foundation walls of channels from the Early Islamic, Late Ottoman and the British Mandate periods; in addition a pool from the Ottoman/British Mandate period was documented west of the excavation area (Golan 2008; 2009; 2010; 2011). 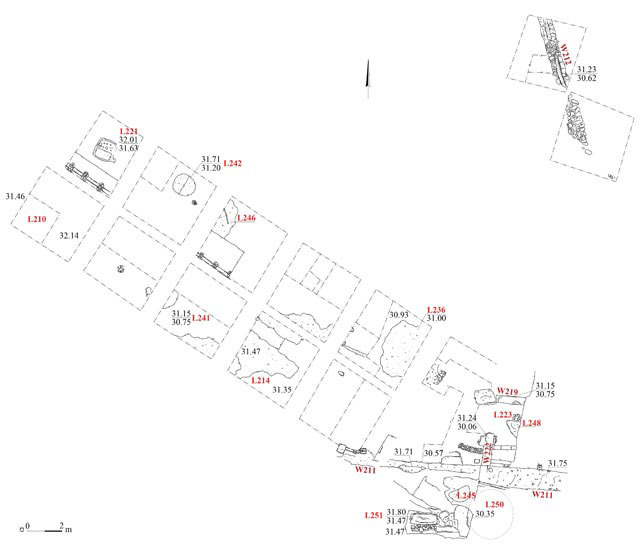 In another excavation, a pool, a well and remains of walls from the Byzantine, Ottoman and British Mandate periods were revealed (Kogan-Zehavi 2006). At Sarafand el-Kharab, c. 1 km east of the current excavation, remains from the Byzantine to the Ottoman periods were discovered, among them occupation levels from the Byzantine period; two settlement phases with buildings and installations from the Early Islamic period; architectural remains from the Crusader period; a Muslim cemetery with infant jar-burials that was probably in use until the 1940s (Glick 1998; Gorzalczany 1998; 2004; Singer 2004); and water channels from the Ottoman period (Golan 2015). At el-Khirba, 1 km south of the current excavation, settlement remains and installations ranging in date from the Persian-Hellenistic periods to the Ottoman period were excavated in an area that was an orchard until the beginning of the twenty-first century (Permit No. A-6823). The current excavation extended across a moderate slope that descends toward the east. The ground is characterized by a layer of dark-brown clay above red hamra. Two areas (Fig. 2) were opened: two squares were excavated in the southern area (A) and fifteen squares were excavated in the northern area (B). 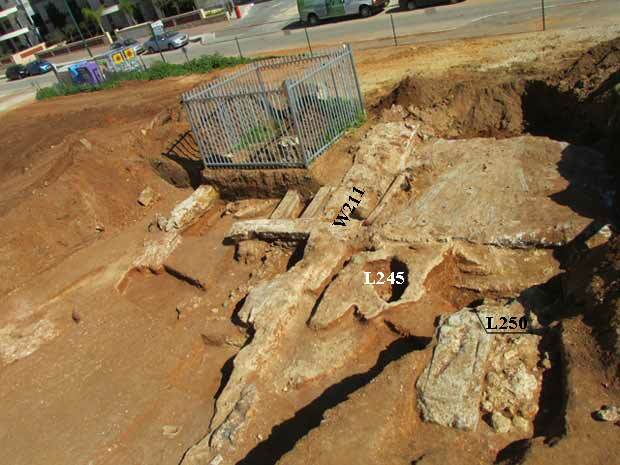 Remains of walls (W104—height 0.1 m, W105—height 0.33 m), which seem to be two sections of a single foundation-wall of a water channel, were excavated, and remains of two walls (W107—height 0.24 m, W108—height 0.25 m), which diverged from the channel, were exposed. The walls were constructed of small kurkar stones, and were preserved to a height of two courses. Wall 107 adjoined W104 along an east–west axis, and was probably a branch of the channel that led to a cultivation plot in the north; W108 adjoined W105 on a north–south axis, and was probably a branch of the channel for a cultivation plot in the south. Fragments of pottery vessels dating to the Late Ottoman period were discovered around the walls (L101, L102, L103, L111). 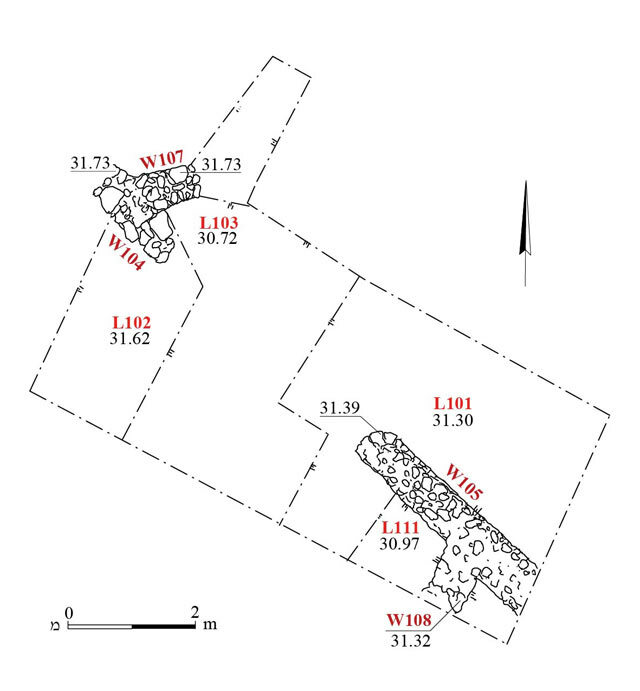 A rectangular lime pit (L221; length 1.34 m, width 1.2 m, depth 0.2 m) with round corners was discovered in the northwestern part of the area; it dates to the Late Ottoman period. A concrete pipe from the time of the British Mandate was revealed south of the pit. East and southeast of the lime pit, were remains of three Late-Ottoman period tabuns (L241, L242, L246). The tabuns were dug into the clay and hamra soil, and their floor was filled with a thin layer of kurkar. The eastern half of Tabun 241 (wall thickness 0.07 m, diam. 1.17 m, depth 0.55 m) was excavated, exposing mainly burnt soil. 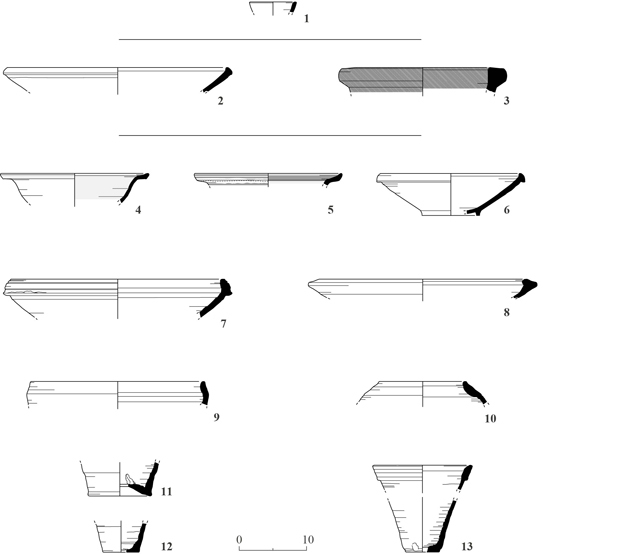 Fragments of pottery, mostly jars, were found inside Tabun 242 (wall thickness 0.07 m, diam. 0.72 m, depth 0.51 m; Fig. 5). Tabun 246 was in a poor state of preservation. Two similar pools (A and B; Fig. 2) were discovered. 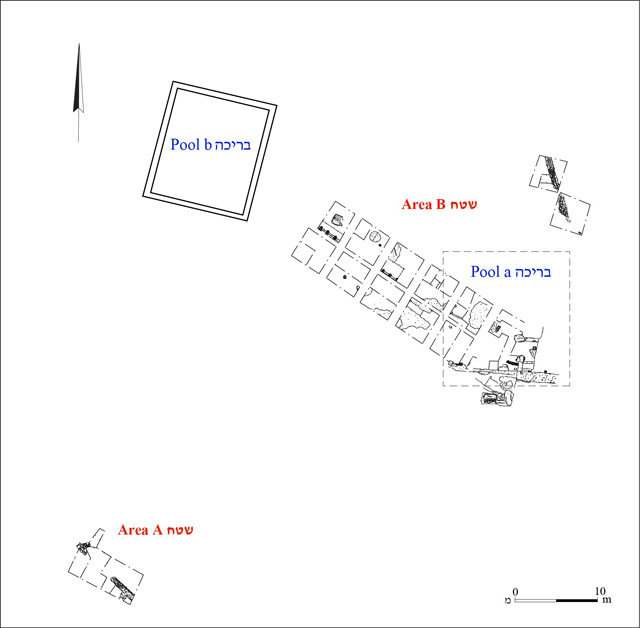 Pool B, to the west and outside the limits of the excavation area, was square (16 × 16 m, depth 2 m). 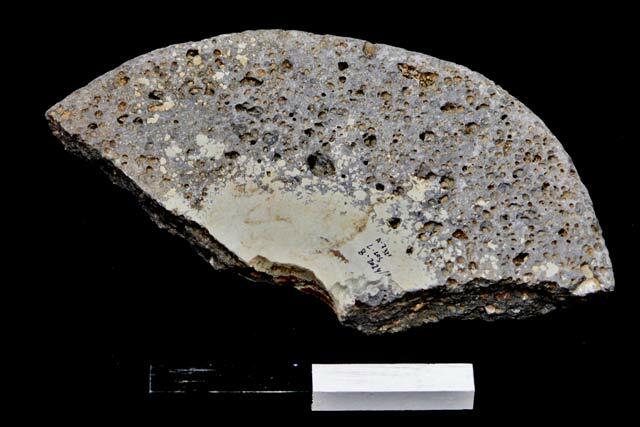 Its walls (thickness 1 m) were built of kurkar stones bonded with mortar, and their inner surface was plastered. 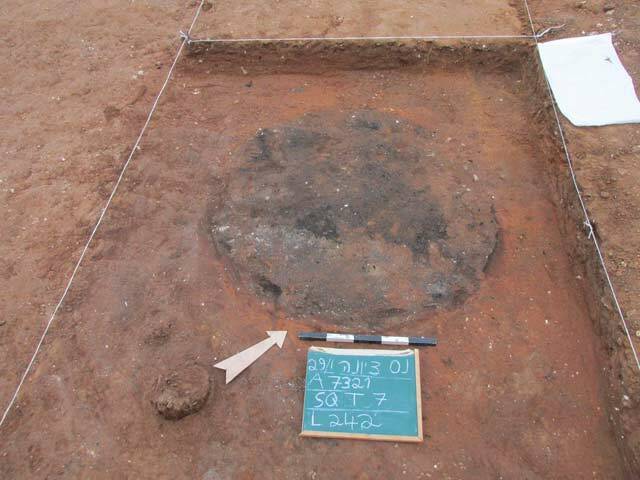 Pool A was in the eastern part of the excavation area. A long wall (W211; length 13.8 m, height 0.52 m; Fig. 6) running east–west and constructed of medium–large kurkar stones was preserved of it. The northern face of the wall was built of roughly hewn stones, which were partially plastered—evidence that this was an inside surface. North of the wall, remains of the foundations of the pool’s floor (L236, L248), made of small kurkar stones bonded with white mortar, were discovered. In a later phase, during the British Mandate, concrete walls (W219, height 0.28 m; W222, height 0.4 m) were built in the eastern part of the pool to make it smaller . 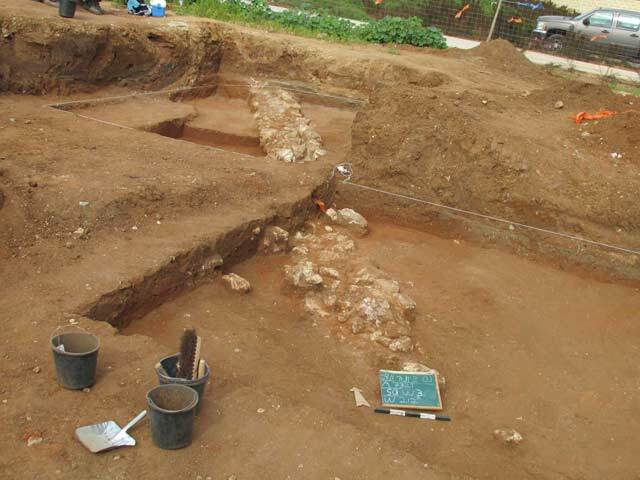 Floor foundations made of small stones and pink clay were discovered south of the pool. Through this floor, a semi-circular installation (L245; depth 0.35 m) was dug, and paved with kurkar stones; the function of the installation is unclear. The outer western wall of a well (L250; c. 4 × 4 m; Fig. 7), which was built of kurkar stones, was identified slightly to the south and at a lower level. In the modern era a concrete surface was poured above the well, blocking and obscuring its opening. At some point during the British Mandate period, a motor was set on a concrete base (L251) west of the well. A concrete pipe, exposed in some of the squares, conveyed water from the well toward Pool B, and it seems that by this time, Pool A, which was next to the well, was no longer in use. An iron water pipe is still connected to the well, testifying to its use in the modern era. Concrete surfaces (L214) were also poured west of the well. A plastered water channel (W212; width 0.2 m, height 0.4 m; Fig. 8), set on a foundation wall of small kurkar stones and aligned north–south, was exposed in the northern part of the excavation area. Pottery sherds dating to the Late Ottoman period were discovered in the vicinity of the channel. Pottery from the Early Islamic period and the Late Mamluk–Early Ottoman period were discovered in a number of points where the excavation went deeper into the hamra (for example L210) . The ceramic finds from Area B included a jug (Fig. 9:1) from the Early Islamic period; a bowl (Fig. 9:2) and a basin (Fig. 9:3) from the end of the Mamluk period or the beginning of the Ottoman period, bowls (Fig. 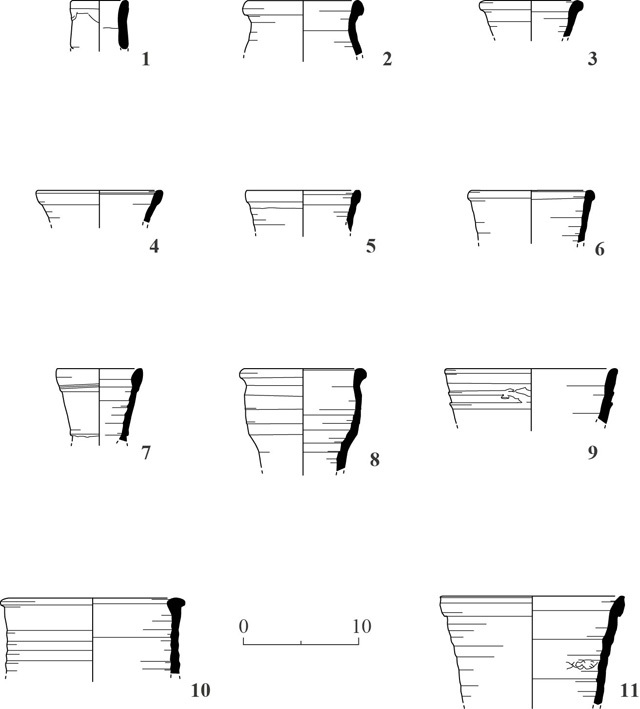 9:4–8), pots (Fig. 9:9, 10), sapling planters used in orchards (Fig. 9:11–13; see Boas 2000; Israel 2006:273–274), jars (Fig. 10:1–6), ‘dairy’ jars for transporting milk (Fig. 10:7; Israel 2006:222–230), an asliyah-type jar for transporting water (Fig. 10:8), a saqie jar (Fig. 10:9) and pipes (Fig. 10:10, 11) from the Late Ottoman period; in addition to these, a fragment of a millstone (Fig. 11 ) was discovered, also dating to the Late Ottoman period. The water channels, pools, well, tabuns and lime pit, are all part of an agricultural complex from the Late Ottoman period, which was modified during the British Mandate. A scattering of pottery sherds from the Abbasid period and the Late Mamluk–Early Ottoman period indicate activity in the immediate vicinity during these periods. The nature of the finds is consistent with those uncovered in previous excavations nearby. Boas A.J. 2000. Pottery and Small Finds from the Late Ottoman Village and the Early Zionist Settlement. In Y. Hirschfeld. 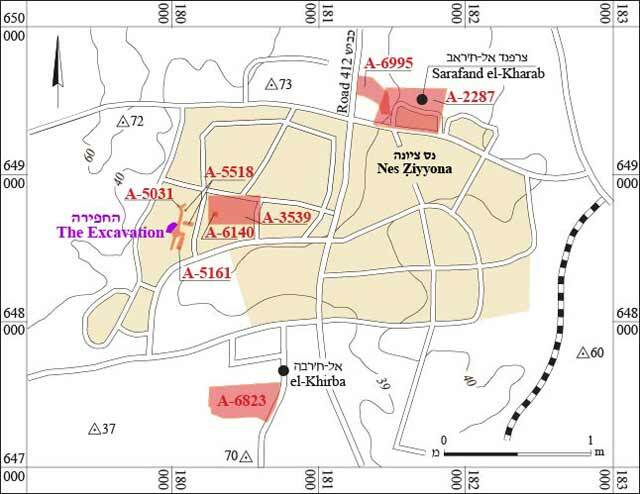 Ramat Hanadiv Excavations: Final Report of the 1984–1998 Seasons. Jerusalem. P. 58. Glick D. 1998. Nes Ziyyona, Yad Eli‘ezer (a). ESI 18:73–74. Golan D. 2008. Nes Ziyyona. HA-ESI 120. Golan D. 2009. Nes Ziyyona. HA-ESI 121. Golan D. 2010. Nes Ziyyona. HA-ESI 122. Golan D. 2011. Nes Ziyyona, Ha-Shayetet Street. HA-ESI 123. Golan D. 2015. Nes Ziyyona, Sarafand el-Kharab. HA-ESI 127. Gorzalczany A. 1998. Nes Ziyyona, Yad Eli‘ezer (b). ESI 18:74–76. Gorzalczany A. 2004. A Site from the End of the Byzantine and the Early Islamic Periods at Sarafand el-Kharab, Nes Ziyyona. ‘Atiqot 46:37–47 (Hebrew; English summary, pp. 130*–131*). Israel Y. 2006. Black Gaza Ware from the Ottoman Period. Ph.D. diss. Ben-Gurion University of the Negev. Be’er Sheva‘. Pp. 73, 111–122, 173–174, 250 (Hebrew; English summary, pp. IV–XII). Kogan-Zehavi E. 2006. Nes Ziyyona. HA-ESI 118. Singer K. 2004. The Pottery Assemblage from the Excavations at Sarafand el-Kharab, Nes Ziyyona. ‘Atiqot 46:49–58 (Hebrew; English summary, p. 131*). 5. Tabun 242, looking northwest. 6. The well complex and Pool A, looking east. 7. The western wall of the well, looking southwest. 8. Water Channel 212, looking north.